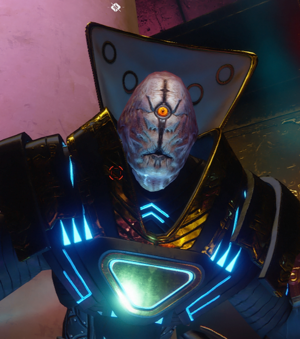 Psions are a powerful race of clairvoyant, technological manipulating, psionic beings who were conquered and enslaved by the Cabal in the hopes of weaponizing their abilities. The Psion's actual name for their species is still unknown to us for the time being. At some point, they created the OXA Machine, a machine able to perceive the future, but the Cabal destroyed it. Freeborn Otzot, a particularly brilliant Psion, later succeeded in rebuilding the OXA Machine, but ironically is the reason why their enslavement has been prolonged. They have worked as pilots as well in their time of service. Psions have bald, veined heads, with a single eye. These eyes can be either blue or orange, and have distinctive Y-shaped pupils. They are smaller than their Cabal superiors. The strength of a Psion's attack depends on the type of Psion. An ordinary Psion will only be able to attack at point blank range, a Psion Operant will be able to launch a short-range attack, and a Psion Flayer will be able to send a psychic attack from quite a long distance. These attacks deal Arc (or electrical) damage, signifying their power over mind and (potentially) machine. Certain Psions are known to channel Void and Solar power, though this is restricted to Flayers observed in the Prison of Elders. Psions become much more dangerous during Nightfall Strikes, as they acquire a Void shield. A sect of Psions belonging to the Red Legion utilize new Void-based abilities as well as Cabal Headhunters. A minority continue to use Slug Rifles. These Psions have an upgraded version of their old wave attack, now referred to as a "rupture ability," which explodes and launches enemies into the air. They also have jetpacks, which they can use to maneuver and travel at high speeds. Red Legion Psions have the upper parts of their heads exposed. Some Psions can be seen piloting Interceptors, specifically in the EDZ - near the fortress Firebase Hades. The Loyalists have a special version of Psions called Councilors, which have special abilities used throughout the Leviathan raid. They float in mid-air and are surrounded by a shield that blocks all projectiles, but can still be punched. The Psion Councilor is the only one of its species to have its face fully revealed. Concept art of Psions repairing a Legionnaire`s armor. A Psion (right) and two Legionnaires on Mars. A Psion Operant launching a devastating telekinetic Arc attack upon three Guardians. A Psion fighting an Arcstrider. The top of a defeated Red Legion Psion.